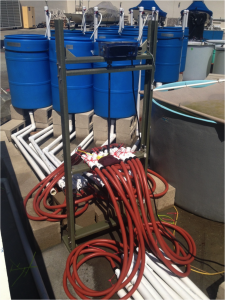 Now Jeremy Long and I have published an open access paper in the journal PeerJ (external link) describing our use of that tide-predicting-motorized-rack, which we called the Tide Height Control system. We used the THC system to recreate real tide cycling in a set of deep lab aquaria where marsh plants (Spartina foliosa) were being raised. By changing the height of the potted marsh plants inside a set of aquaria, we could simulate the submersion conditions for different real-world shore heights. Plants higher on the shore spend less time in the water than plants lower on the shore, and we observed reduced plant growth higher on the shore, even over a small 0.4m shore height difference. Several barrels with drain hoses attached to the Tide Height Controller moving rack, at the San Diego State University Coastal Marine Institute Laboratory. Photo by Jeremy Long. The motorized rack moved up and down over a 0.84m (2 ft) range of the tide, when the real world tide was between +2.07m and +1.23m. The drains of each deep barrel were attached to hoses that run over the moving rack of the THC system, so that as the drain hoses raised and lowered, the water levels in the barrels would rise or fall to match the height of the moving rack. This meant that water would drain away from the soil in the plant pots at a rate similar to what would occur in the field, slowly exposing the plant stems and root systems, and then re-submerging them when the tide rose again. PeerJ is a completely open access journal, so you can read our paper, or any of the other papers there, for free. The paper includes links to the permanent online repositories for the Arduino code, instructions and drawings for building a THC rack, R code used in the analysis of the data, and of course the data for the paper. There are also “live” repositories on GitHub for the tide prediction libraries and the code used to run the THC rack itself.